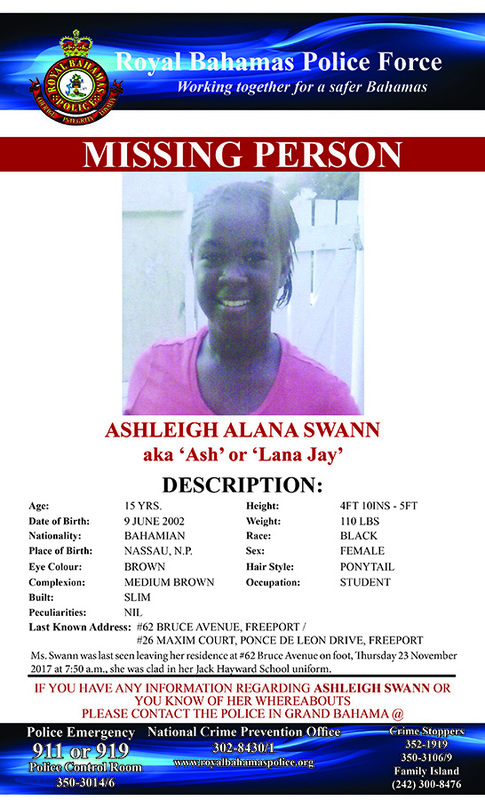 Freeport, Grand Bahama - Police in Grand Bahama need the public’s assistance in locating 15 year old Ashleigh Alana Swann aka “Ash” or “Lana Jay” of #62 Bruce Avenue and #26 Maxim Court, Ponce De Leon Drive, Grand Bahama. She is described as standing between 4’10” and 5ft, slim built, weighing 110 lbs. with medium brown complexion. She was last seen on Thursday 23rd November 2017 leaving her residence on foot at #62 Bruce Avenue wearing her Sir Jack Hayward School uniform. If you have any information regarding Ashleigh Swann or if you know of her whereabouts, please contact the police in Grand Bahama at telephone numbers 350-3107 thru 12 (Central Detective Unit ), 911/919 ( Police Emergency )or call your nearest police station. CRIME PREVENTION TIP – TAKE A STAND AGAINST ILLEGAL FIREARMS BY COOPERATING WITH THE POLICE IN PROVIDING INFORMATION REGARDING THE WHEREABOUTS OF ANY ILLEGAL FIREARM.